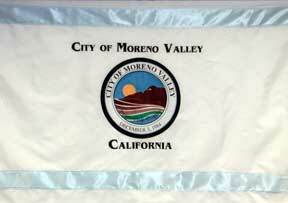 The City of Moreno Valley has a new flag. "This new flag was unveiled on the 21st birthday of the incorporation of the city (3rd December 2005). It replaces the flag that was ordered by the City's first Finance Director Ann Marie Gallant in 1989. The flag is a full color replica of the City Seal, approved by then City Council consisting of Patty Goodwin, J. David Horspool, Cynthia Crothers, Judy Nieburger and Denise Lanning. It has been stored and maintained by the City Council staff and since that time displayed for ceremonial purposes at the League of California Cities Conference and at a variety of City functions." The former flag was ordered by the City's first Finance Director Ann Marie Gallant in 1989. The flag is a full color replica of the City Seal, approved by then City Council consisting of Patty Goodwin, J. David Horspool, Cynthia Crothers, Judy Nieburger and Denise Lanning. It has been stored and maintained by the City Council staff and since that time displayed for ceremonial purposes at the League of California Cities Conference and at a variety of City functions. On December 3, 1984, the City of Moreno Valley was officially incorporated as a California general law municipality. The City Seal was adopted by the new City Council in 1985. Dominated by the familiar Box Springs Mountain (with the distinctive "M"), the seal design is actually a composite of three winning entries from a citywide contest. The artists were: Robert J. Vasquez, Penny Fithian and Nancy Edwards. The City Motto, "People, Pride, Progress," was suggested by the League of California Cities.